Investigations by a coalition of Democrat state attorney generals into Exxon Mobil’s climate change research from the 1970s onward probably won’t result in criminal prosecution, says a Texas law professor, but civil penalties are a possibility. NY Attorney General Eric Schneiderman at podium, flanked by Al Gore (left) and other AGs. And the investigation will probably help fuel the #Exxonknew campaign started last year by Bill McKibben, the eco-activist who began the anti-Keystone XL campaign that revitalized the North American environmental movement, resulted in President Barack Obama rejecting the TransCanada application, and kick started the “keep fossil fuels in the ground” movement that is just getting started. University of Houston Law Center. “The climate change research, there’s a lot of participants in this, and it’s not clear that energy companies are the ones who know best about climate change,” he said. State attorney generals supporting federal legislation is not unusual, according to Kwok. How is the investigation – or investigations – likely to turn out? Kwok says he has limited facts about the specifics of the case, but given what is generally known it is hard to imagine the AGs would have enough for criminal prosecution. Prof. Kwok expects there will be a “strong public relations” aspect to the case. The longer the investigation drags on, the worse it is for the energy companies, especially Exxon Mobil, which is the biggest target. 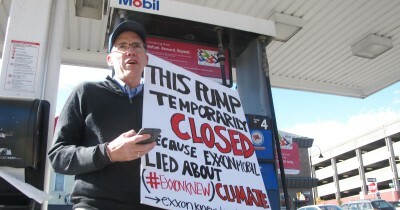 Bill McKibben protesting outside a Vermont gas station. “Climate change is obviously a high profile issue. Beyond the pure legal questions, I think in the minds of the companies will be, ‘What’s the PR angle to this?’ How long will the companies engage in a public fight about this?” he said. Peabody Energy, the giant coal producer, has already settled with Schneiderman, agreeing to revise shareholder disclosures with the Securities and Exchange Commission to “describe possible future reductions in projected demand for coal” caused by climate change regulations. The agreement doesn’t require the company to pay fines or reimburse New York for the cost of the investigation. New York has requested similar documents from Exxon Mobil and it appears the investigations will be similar. Suzanne McCarron, Exxon Mobil VP of public and government affairs, says that the allegations “are politically motivated and based on discredited reporting funded by activist organizations.” The tone of her remarks made it clear the world’s biggest oil and gas company intends to fight back. A key argument will be that if fossil fuels companies are subject to prosecution over scientific inquiry they conducted decades ago, legal scrutiny will “have a chilling effect on private sector research,” and possibly work against finding solutions to climate change. 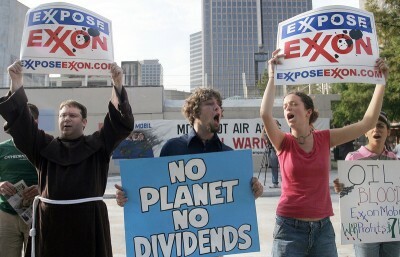 Will Exxon Mobil fold to make this issue go away, as Peabody did? I don’t think so. The legal investigation and McKibben’s #Exxonknew campaign are in their early stages, but we appear to be in for a very public and very messy fight. Exxon Mobil is staking out its public relations turf and investigating its legal options, which will almost certainly include a vigorous defense against the AG’s allegations. But remember the example of Keystone XL. Facts and science don’t matter. What matters is how adroitly Exxon Mobil – and the industry in general – handles the public spotlight that is headed its way. 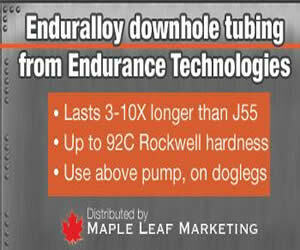 If Exxon Mobil fumbles the response, as TransCanada did, the consequences could be significant. Keystone XL stands as a reminder of just how significant.